This is the final factoid in a series of four factoids showing the rise of E-Commerce in the Furniture Industry. With the sophistication of the internet has come the booming growth of e-commerce. The combined furniture and home furnishings industry has been one of the big recipients of this growth second only to the clothing/footwear industry. It is estimated that 2015 internet sales of furniture alone now totals an estimated $14 billion or 15 percent of furniture industry sales. While internet purchases have made major inroads into many consumer product areas, e-commerce is still a small part of overall retail sales. 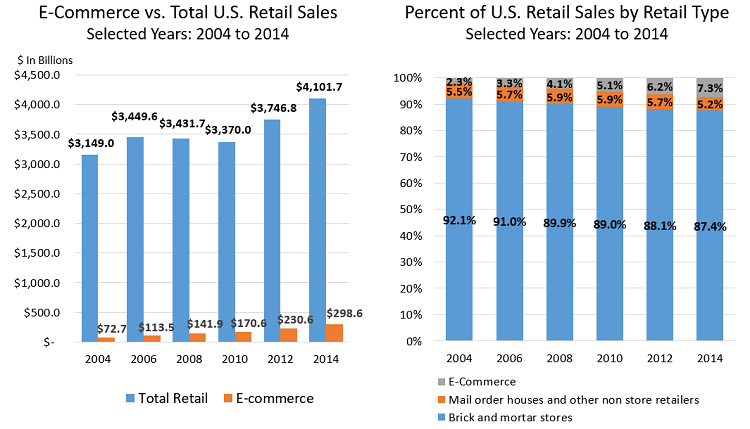 According to the new government e-commerce report covering years 2004 to 2014, sales from e-commerce for all U.S. retailers, both brick and mortar retailers and e-commerce, for all consumer products excluding gasoline totaled $298.6 billion in 2014. This reflects an increase of 14.3 percent from the year before and a 311 percent change over ten years. Meanwhile total retail sales, excluding gasoline, grew 30.3%. According to the Census Bureau, the internet claimed 7.3 percent of all retail sales, excluding gasoline, in 2014, up from 2.3 percent ten years before. While the growth of internet sales of some products appears to be slowing, other product areas, like food, are still in their e-commerce infancies. The rapid growth of furniture industry sales by successful e-commerce retailers are challenging the brick and mortar stores and presenting a distribution dilemma for manufacturers. The next factoid series will highlight the changes in manufacturing brought on by the rise of e-commerce.